↑ McGlaughlin, Buddy (जनवरी 10, 2011). 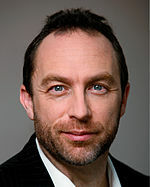 "Wikipedia founder Jimmy Wales, a Huntsville native and Auburn grad, not resting as website turns 10". The Huntsville Times. अभिगमन तिथि December 2, 2011.